Devil’s Chest rule Uganda film awards. The 2017 Uganda Film Festival climaxed on Friday with the awards show held at the Serena Hotel gardens. For an award show that has in the past been embroiled in drama due to misplaced nominations or questionable winners, it was surprising that filmmakers turned up in big numbers. Many noted that they showed up because unlike the previous years, they had taken an effort to watch the most nominated films and were aware the competition was tight. This year, Steven Anyen's Kony; Order From Above and Devil's Chest by Hassan Mageye were primed to win big since they were original stories beautifully delivered. Both films are also about the northern Uganda war. In the end, Devil's Chest was the biggest winner after bagging all the accolades in which the two films were nominated. 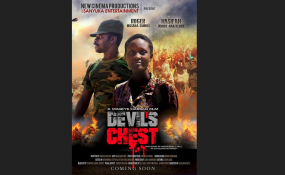 Staring Roger Masaba and Hasifa Nakitende, Devil's Chest tells a story of the northern war and its effects on the people in the region. The film walked away with Best Cinematography, Editing and Post Production, Sound, Costume and Production Designs, Feature and Film of the Year. NTV's Yat Madit took home all the TV drama accolades, including Best Actor and Actress in a TV Drama for Michael Wawuyo Jnr and Rehema Nanfuka. Sister Dipio, the head of the jury, noted that the quality of film has greatly improved in the past years, though she noted that the film needs to streamline the importance of other people's roles in the industry. In her submission, she pleaded with the festival to start programming foreign films to give inspiration to local film makers on the quality they should aspire to achieve.